%VIRTUAL-SkimlinksPromo%A former London Underground station that was used as a Second World War command centre has been sold for £53 million. Brompton Road Tube station, in an expensive corner of London near Harrods, was put on the market in September by the Ministry of Defence as part of cost-cutting efforts. It is now expected to be used for mainly residential development, with the money from the sale going back into the defence budget. The Piccadilly Line station, which was designed by English architect Leslie Green, retains its original distinctive green and brown wall tiles - the hallmark of many of the Underground's historic stations. It was opened in 1906 but closed in 1934 after London Underground decided it was no longer financially viable. During the Blitz, the building was taken over by the War Office and used to control anti-aircraft batteries to protect London from air raids. The 28,000 sq ft property contains a drill hall, garages, offices and mess above ground and has recently been occupied by the London University Air Squadron (UAS), the London University Royal Naval Unit (URNU), and 46F Squadron Air Training Corps (Air cadets). 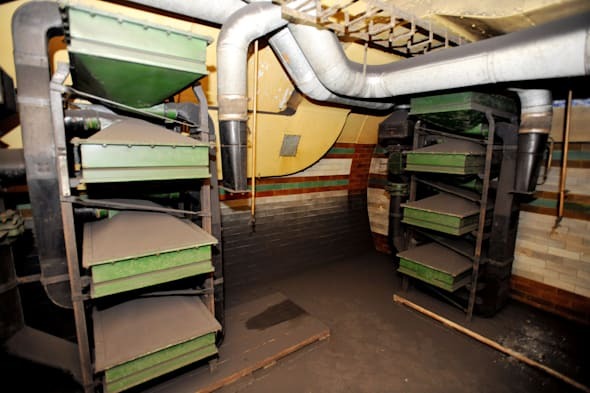 There are also several underground areas, previously used as part of the former Brompton Road Underground station, but they have been left largely unused since the end of the Second World War. Today the only remnants of the site's military past are a large map of London, the MoD said. It is working with the National Archives to make sure it is recorded. Announcing the £53 million sale, defence minister Andrew Murrison said: "The Ministry of Defence is committed to selling off its surplus land and property in order to provide the best possible value for money to the taxpayer. "At the same time we take our role as a custodian of the nation's history very seriously and have been working to record the historic significance of the building."